Trenton, New Jersey (CNN) - The George Washington Bridge scandal had become "a major distraction" to Gov. Chris Christie last December, according to his chief of staff, who also said on Monday that a central figure in the uproar denied any involvement when confronted. 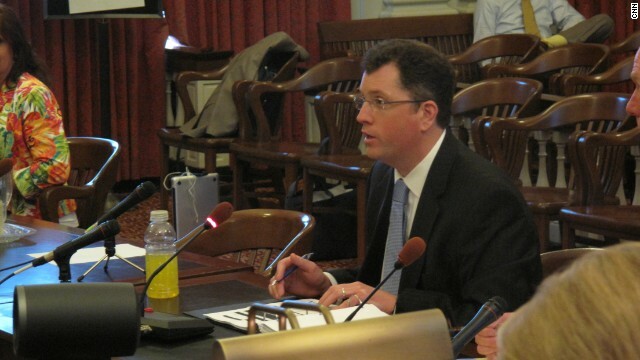 Kevin O'Dowd became the most senior member of the Christie administration to testify before a legislative committee looking into the controversy that has upended the Republican’s administration just as he considers a bid for president in 2016. The scandal involves suggestions that Christie appointees abused their authority by orchestrating traffic jams at the foot of the nation’s busiest bridge last September in a Fort Lee to punish that town’s mayor for not backing the governor’s reelection. O’Dowd said he met with Christie and his campaign manager at the time, Bill Stepien, at the governor's residence on December 12. Christie was being dogged by allegations that the deliberate closure of bridge access lanes was politically motivated. During the brief meeting, O'Dowd testified that Christie asked him to go directly to a key staffer, Bridget Kelly, to see if she had any involvement. O'Dowd said the governor told him, "’This bridge issue is still out there. The noise on political retribution is still out there. This is a major distraction. I need you to talk to Bridget Kelly.’"
Kelly is a central figure in the scandal who, like Stepien, so far has resisted a subpoena by the committee to turn over documents and other information. Both have lost their jobs over the controversy. She has been identified as writing the infamous email “Time for some traffic problems in Fort Lee” to David Wildstein, a Christie appointee at the Port Authority of New York and New Jersey, which oversees bridge operations. O'Dowd said he spoke with Kelly on the phone later that day. "I said ‘Bridget I need to ask you about the lane closures. Did you have anything to do with the closing of the lanes at the George Washington Bridge?’" O'Dowd testified that her response was "’absolutely not.’"
At the time O'Dowd said he had no reason not to believe Kelly. He called her hard working, energetic, loyal and trustworthy. "She was someone I believed and trusted," he said. O’Dowd’s description of Kelly contrasted sharply with a review of the scandal conducted by lawyers hired by Christie’s office. That investigation described her as erratic and emotional around the office. O'Dowd told the committee that he had nothing to do with the fiasco and had no prior knowledge. He repeated what has been the Christie administration's claim all along: that Wildstein deserved most of the blame for the controversy. Appearing before the committee previously, Wildstein opted not to offer testimony. He has resigned from his job. Christie has denied knowing about the closures until after they occurred. -just because top aid said it is official? Nonsense. He did it. He should not have done it in the first place, then he would not be distracted. The question that should have been asked would have been how many times contact was made between this aid and others named aides that were fired. Did Gov. Chris Christie in his past lobby for Bernie" Madoff ? That fat administration is more dumb than I thought. What else did they think was going to happen? Four days of bridge gate and they thought nobody would notice? The fact that he's still tumbling around says a lot about the teaklan crowd. This guy is toast. He's just trying to stay away from NJ and his governorship. Reminds me of somebody else except I don't think he will quit mid term. I'm sure it did until he paid a law firm to clear him. And all those fired aides forced to fall on their swords because no one is gonna cross Governor Soprano.